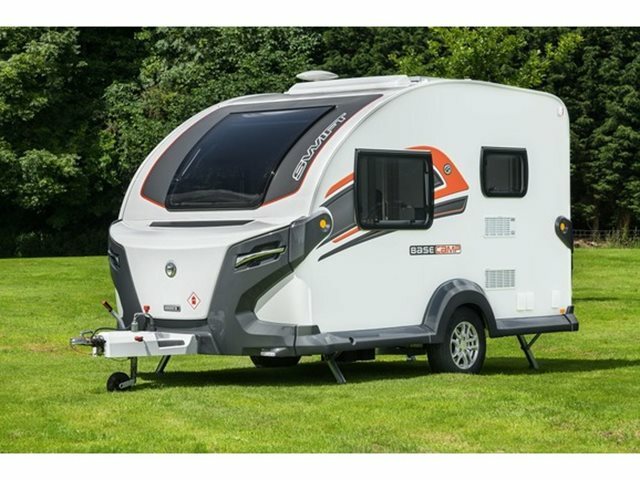 Brand new in 2017, Swift introduced the ultimate crossover camping vehicle; the Basecamp. Due to its popularity an early production run has been put in for the 2018 model to meet demand. This lightweight two berth has been designed for those active couples who want to get away all year round and still be comfortable. Externally it benefits from the SMART Plus construction which has GRP body panels and roof, as well as GRP outer and inner skins for added balance on the side walls. The aerodynamic shape not only looks great but also cuts down on fuel consumption. Internally the Basecamp has the new Swift Command control system. Command includes an intelligent power supply unit and LCD control panel which allows you to remotely control and/or monitor certain systems either inside the vehicle or away from it. Also added to this is the option to subscribe to a pro-active Thatcham Level 6 tracker. There is plenty of specification as standard including FENIX kitchen worktops, Dometic 85 litre fridge, Thetford cassette toilet, Whale dual fuel rapid water heater and under floor blown air heating, LED lighting and Thetford 3 burner hob and separate grill to name but a few. This two berth Basecamp features two bench seats to the front, a kitchen on the nearside and wash-room on the off side, with rear entrance door. Our Basecamp also includes the optional Plus Pack which includes solar panel, TV aerial, TV bracket with travel lock, extrenal 230v mains point, external BBQ point, external shower point, door flyscreen and oven with integral grill. Other options include a choice of 13 graphic schemes, ATC stability control system and a Vango air beam awning. No part exchange? Please call for our excellent no PX price. For any further information please contact us on 01384 413336 and ask for a member of the sales team. PLEASE NOTE PRICE INCLUDES PLUS PACK AND DEALER DELIVERY CHARGE, WITH NO HIDDEN EXTRAS.